Although you may think blogging is yesterday’s social media news, almost 7 out of 10 marketers plan to increase their blogging spend in 2014, according to Social Media Examiner’s 2014 Social Media Marketing Industry Report. Has your business blog been put on the back burner, leaving it to limp along on life support while you deal with trendier priorities? To be effective, your blog needs a constant flow of people. Measure how many people visit your site. To this end, your blog needs multiple entrances and ways that attract visitors such as being optimized for search. Also check whether people return to your site and what drives them to your site (social media and search). Once people find your blog, do they take the time to read your content? Check the amount of time they spend on your blog, how many pages they view, and where they go on your blog. You blog isn’t just about me, me, me. It matters how other people react to it. To this end, it’s important to provide social proof in the form of social shares and comments. This provides credibility for your readers. What do visitors do once they visit your blog that’s associated with your business objectives? Share your content, sign up for email or feeds, and/or purchase. How is your blog doing based on these metrics? 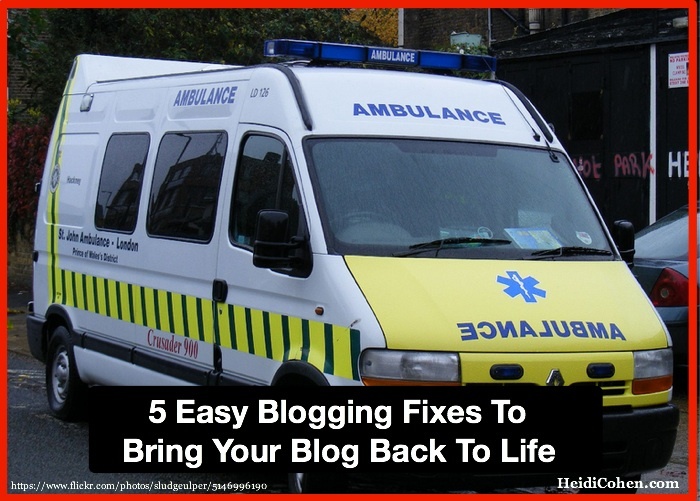 Don’t despair; you can resuscitate your blog with the right type of effort and resources to support it. Here are 2 examples of blogging darlings that went from “What to do on your business blog” to “What not to do on your business blog.” Look at them closely and you’ll see that within their DNA is the ability to shine so that they’re easy to make into stars again. 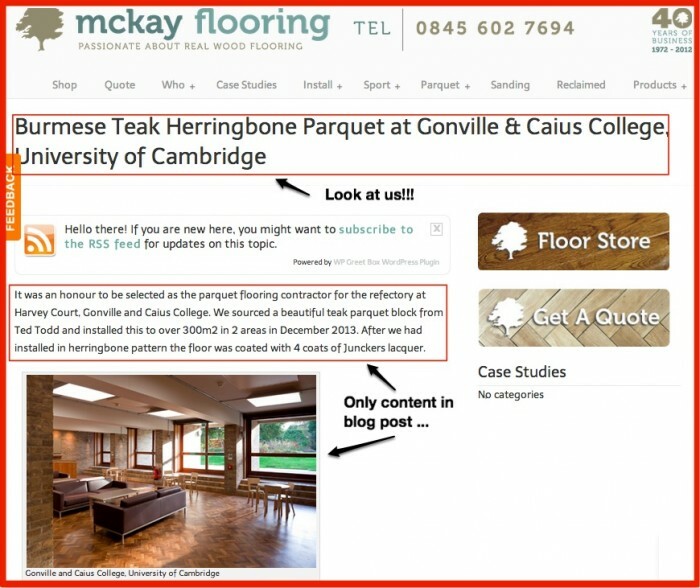 Mackay Flooring in Scotland used to have an amazing blog. Now it’s home to corporate press releases. Look at the difference between the interesting older content and the newer, PR focused content. 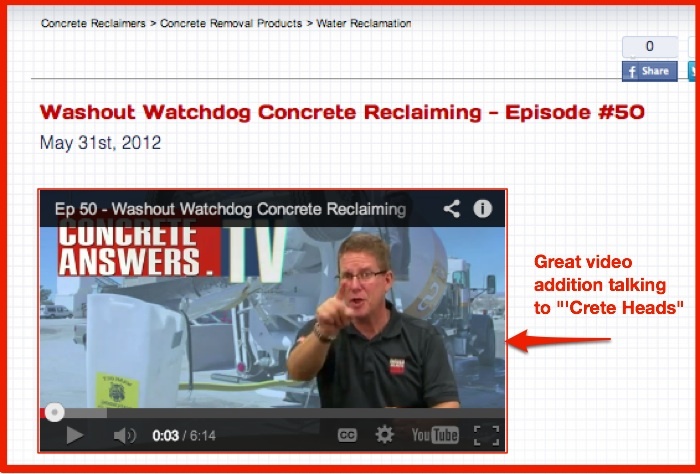 The Mid Atlantic Concrete Equipment Company had a great blog with a video, aptly named “ConcreteAnswers.tv”, but no one has created either blog posts or videos in about 2 years. Don’t worry—here are 5 easy blogging fixes to bring your blog back to life with examples and charts. 1. Create compelling content for your blog. Your blog shouldn’t be a dumping ground for your reformatted press releases and rehashed product news. Really?!? You think that anyone wants to read these pieces of corporate dribble? Remember blog beauty is in the eyes of the reader, not your boss! Actionable Blogging Fix: Provide the 5 basic content formats that your key audience actively seeks: product information, customer FAQs, how-to’s, styling and ratings and reviews. Most important of all is to answer your prospect and customers’ questions including price. Marcus Sheridan’s answer to the pricing question drove $2 million in sales. 2. Package your blog content for consumption. Don’t assume that great content just happens. You need to make your blog posts easy-to-consume and share. Orbit Media’s Andy Crestodina recommends writing blog posts that are at least 1,500 words with paragraphs of 3 to 4 lines. This makes the information easier to scan and attract links. Crestodina suggests, “Your metadata [should] be a single sentence in plain English, summarizing the content of the page. Use the target keyphrase once and don’t make it too long, [ideally 155 characters].” (Note: Yoast’s SEO plug-in helps with this.) Also add images and videos to attract interest since people are visual beings. 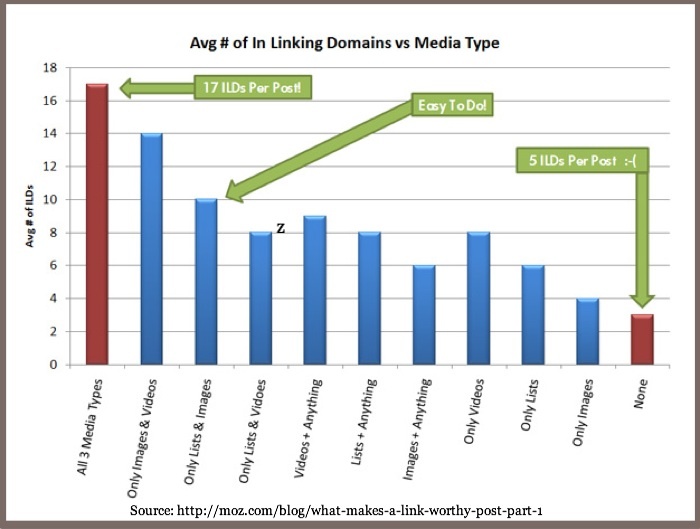 Research by Moz shows that adding images and videos improves linking, especially when coupled with lists. The Sartorialist consists only of photographs. Actionable Blogging Fix: Take the time to improve the formatting of your blog posts. Make them easy to read and share. 3. 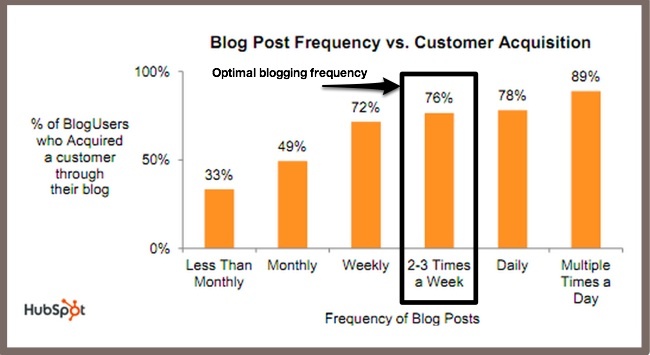 Publish blog posts on a consistent basis. While blog experts who recommend only blogging when you have something meaningful to write make an important point, you need to provide useful information on a regular basis to build an audience. Hubspot research revealed that you must publish about 2 to3 times per week to get most of the customer acquisition impact. 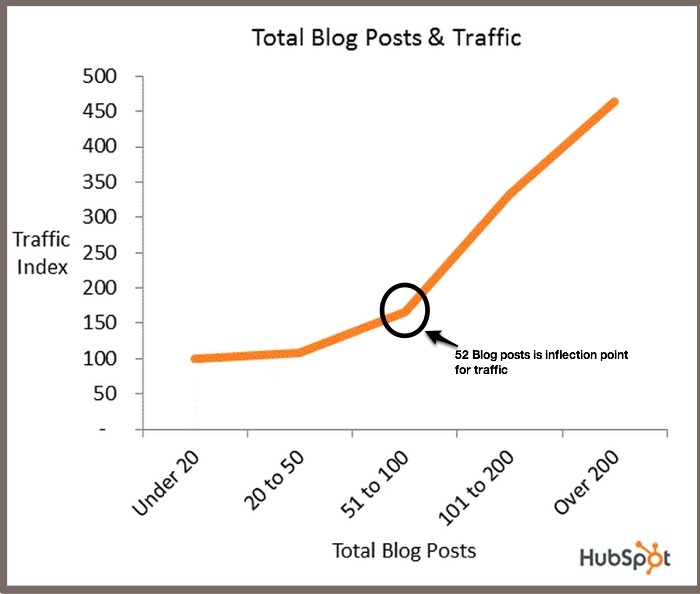 There’s an inflection point when you’ve published 52 blog posts since you’ve started to build depth of content. Actionable Blogging Fix: Set up an editorial calendar. Have a plan to ensure that you post useful content to attract an audience and keep it going. To this end, create regular columns and assign people to write the posts. It must be part of their jobs. 4. 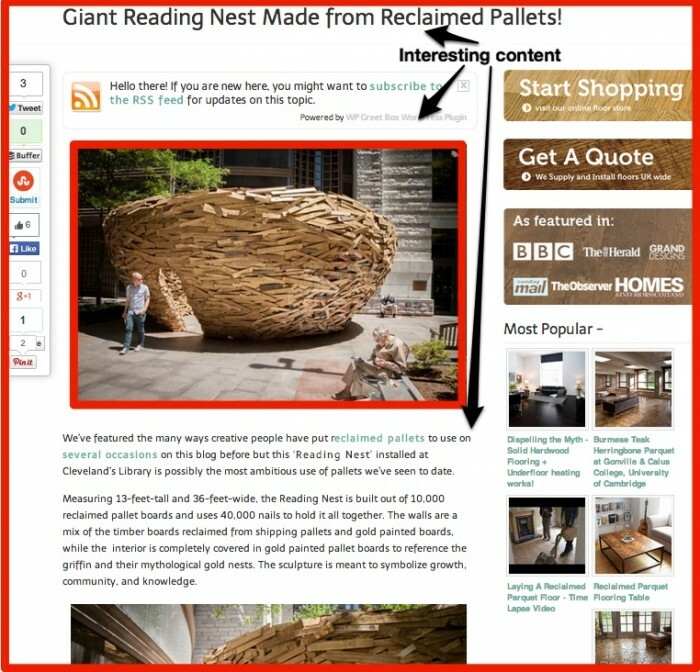 Distribute your blog content widely. Halpern published less than once per week. He LASER-FOCUSED on blog post DISTRIBUTION to the RIGHT people. Halpern’s point: What’s the use of great content if no one reads it? 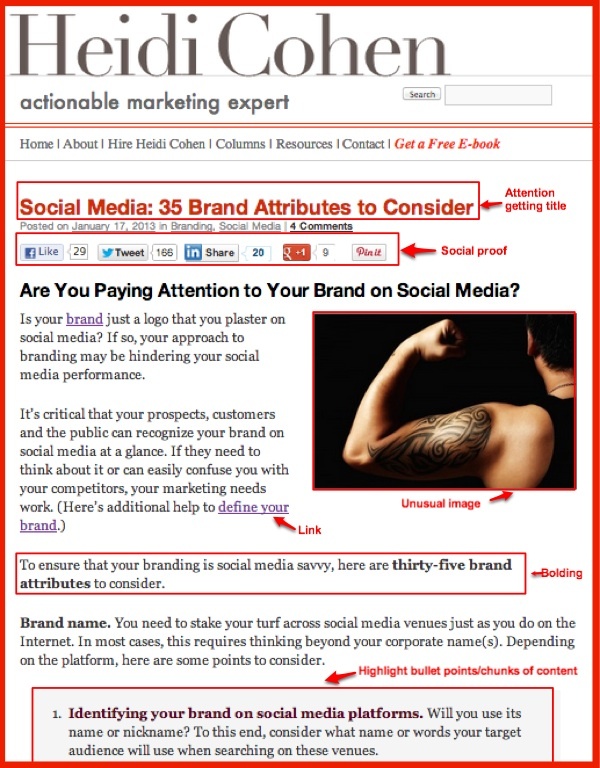 Actionable Blogging Fix: Follow Halpern’s advice and get the word out about every post!!! Have a content distribution checklist of owned, social media and third party media to ensure that you increase each article’s reach. Where necessary augment your distribution with advertising. 5. Build a community around your blog. The objective is to influence the influencers and opinion leaders in your niche. The 12Most blog provides a great example of how to accomplish this. Peg Fitzpatrick and Paul Biedermann created an active community of contributors and promoters around this blog. They made creation and promotion easy and fun. Every post title starts with the words “12 Most” and each post has 12 related points. Bloggers and members of the community are asked to promote their own posts and those on the site. Result: Blog with continuous flow of content and vibrant community to support it. Actionable Blogging Fix: Understand your target audience and become a part of their communities across different platforms (including real life). As part of this process, determine who the influencers are and what’s in for them in associating with you and your blog. Bear in mind that they get LOTS of requests like yours on a regular basis. One way to break through the influencer clutter is to play to their vanity by featuring them in your content with links back to their content. 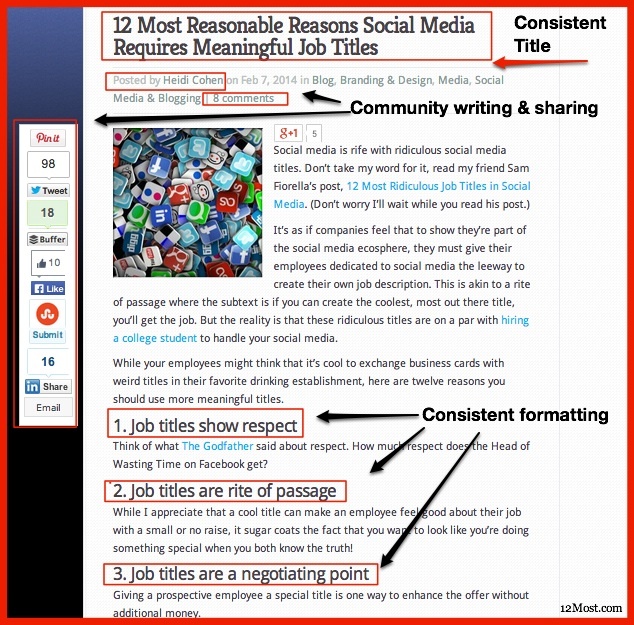 This can then help your content distribution if they share it. If your blog has these symptoms of being on life support, you need to act fast to get your blog alive and kicking. The good news: You can save your blog! BUT you must act now!!! This doesn’t mean a one-time flurry of activity. You must continuously dedicate time and resources to make your blog achieve your business goals. What else can you recommend doing to breathe life back into your blog and why? The Death of the Boring Business Blog – 30 Tips to make your blog sizzle. Tags 12most, Andy Crestodina, Marcus Sheridan, Paul Biedermann, Peg Fitzpatrick, The Satorialist. Bookmark the permalink. Heidi – these tips are perfect for me right now just coming back to work after taking a year away for family reasons. I’ve been working to breathe life back into my blog because the loss in momentum from this time away has been pretty discouraging at times. I’ve got some of these tips implemented now, but you’ve given me some new insights I can’t wait to put into practice! Thanks Lady! 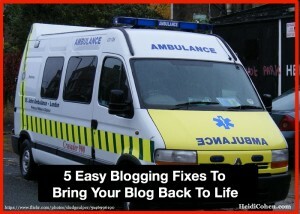 Hi Heidi, great tips on how to revive a blog. The advice number 3 seems the most important one, as publishing regularly is what makes the blog active and keeps the visitors coming. However, this task demands a routine and determination in order to be successful at keeping up with the schedule. Excellent resurrection advice for the moribund blog.It seems as blogging has gotten “corporate trendy”, it’s also fallen prey to some unfortunate side effects at times. 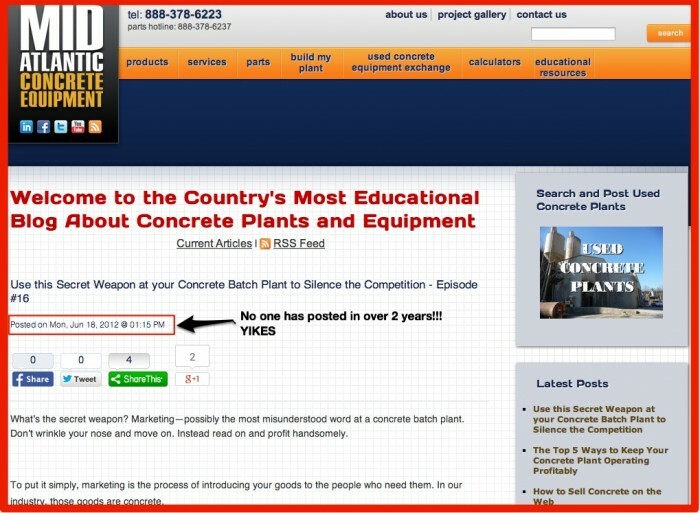 Your first example with the flooring company illustrates this perfectly. Derek’s picking up 27k subscribers from less than 3 monthly posts is impressive to say the least. Of course, he is a LinkedIn superstar, and has effectively leveraged that reach to gain blog subscribers. Still it’s impressive. I’d quibble with you over 2 – 3 weekly posts being optimum for lead generation. Upping the posting frequency to 2 – 3 times daily drives even more. Nearly 20% more organizations acquired customers by posting that frequently over only 2 – 3 times weekly. The question then becomes one of ROI. Are you getting enough of an increase on the 700% greater content requirements to make it worthwhile, or would those resources be better spent elsewhere?